Above: Gov.-elect Larry Hogan Jr., right, announced former Sen. Bobby Neall will head his transition team on budget issues. 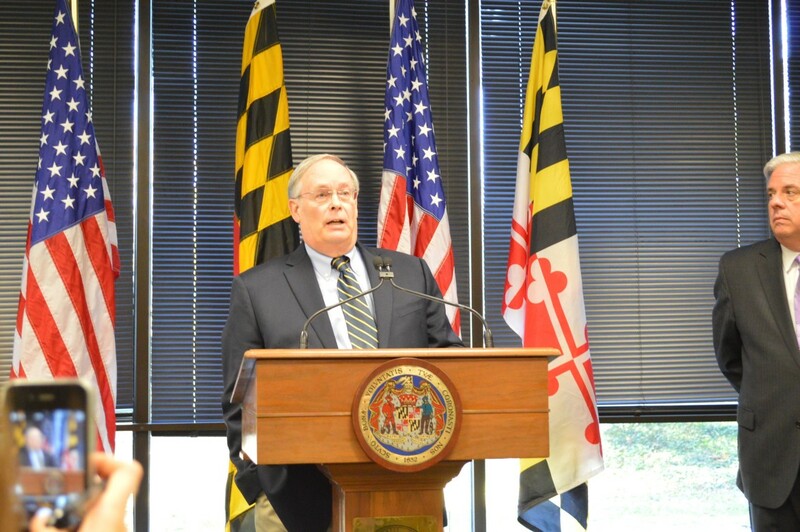 “Maryland has yet to fully resolve its fiscal problems,” Warren Deschenaux, the fiscal and policy director of Department of Legislative Services, concluded his staff’s 90-minute presentation. “We have moved from the acute phase to the chronic phase,” and the General Assembly has failed to permanently adjust mandates and entitlements, largely on health care and education, that make up half of the general fund budget. There is already a deficit of $300 million in the fiscal 2015 “balanced” budget the General Assembly passed six months ago, and a looming $600 million deficit in fiscal 2016. None of this came as a surprise to the only member on the Spending Affordability Committee who is not a current member of the General Assembly, former state Senator Bobby Neall. Just hours before the hearing, Hogan announced Neall would head up his transition work on the budget. Neall said in an interview after the hearing that he had already seen the deficit numbers working with Gov. Martin O’Malley’s budget director and the legislative staff. “The most glaring thing is the growth in debt,” Neall said. The principal and interest payments on state bonds — debt service — will soon take $500 million from the general fund in addition to the proceeds of the state property tax. O’Malley had taken cash out of special funds for open space and Chesapeake Bay restoration, and replaced the money with bond debt. Neall has been pleading for years with the Spending Affordability Committee not to increase the allowed debt. Hogan appointed Neall because he is an recognized fiscal whiz who had served as Republican Anne Arundel County executive and switched parties in the Senate. Neall also has good relations with Senate President Mike Miller and other legislators. “There will be precious few opportunities to tweak a budget that was really put together by the previous governor’s staff,” Neall said. Hogan is required by the Maryland Constitution to submit a budget two days after his Jan. 21 inauguration. He reiterated his campaign theme that Maryland “spends too much, borrows too much and taxes too much” to the detriment of the state’s economy and jobs. “Anything that doesn’t have to do with these things, we’re not going to focus on,” he said. He said he was surprised at the intensity of response to him during a Veterans Day Parade in St. Mary’s County Tuesday. “People are really desperately looking for Maryland to go in a different direction,” Hogan said. But even before he goes in that different direction by reducing spending and taxes, Senate Budget & Taxation Committee Chair Ed Kasemeyer said the new governor needs to fill the $300 million hole in the current budget. Then Kasemeyer, D-Howard-Baltimore counties, hoped the new Republican governor and the Democratic legislators can come together to solve the long-term problems. Del. Andrew Serafini, R-Washington, asked Deschenaux if some “economic boom” is likely to cure the state fiscal woes.